One of our youth sports clients was recently involved in a serious charter bus crash. One child was tragically killed and some 45 others were hospitalized. This unfortunate incident resulted in extensive national media coverage. Worse was the pain and suffering of the sports organization, families, and community. The use of charter buses is a relatively safe mode of transportation for sports organizations compared to other options. However, catastrophic crashes do occur and can result in serious passenger injuries and/or fatalities. In most cases, the charter bus company carries sufficient auto liability limits to cover the damages. But that is not always the case, and the sports organization can find itself in serious legal jeopardy. Sports organizations can manage this risk by adopting the simple risk management precautions discussed here. National statistics indicate that traveling in a charter bus is safer than other common forms of travel. A charter bus is 50 times safer than a car, and twice as safe as air travel. However, serious charter bus accidents always capture intense media exposure, which may inflate the risks in the minds of the public. Most athletic department administrators hire charter buses on the basis of price and availability, rarely paying attention to safety records. However, experts recommend giving safety records top priority, as will be explained later in this article. Examples of common safety violations that raise red flags include reports of crashes, driver violations, worn tires, unqualified drivers, failure to record entries in logbooks, driving without adequate rest, allowing drivers to operate before passing drug tests, and inoperable emergency exits. The owner and the driver of the charter bus bear most of the legal brunt if something goes wrong. But the sports organization still owes a legal duty of due diligence in managing the hiring of the company and the supervision of passengers. Charter bus accidents often result in serious injuries or fatalities to multiple passengers. This means it’s possible for the auto liability limits of the charter bus company to be exhausted. Accident Insurance: Participant Accident Policies often provide coverage for not only practice and games, but also group transportation to and from practices and games. Accident policies include medical limits that commonly range from $25,000 to $250,000. However, medical coverage is usually excess to other collectible insurance, such as family health insurance. Accident policies also may include an accidental death & dismemberment benefit which commonly ranges from $5,000 to $20,000. Non-owned and Hired Auto Liability (NOHA): A NOHA policy may be a stand-alone policy or may be endorsed onto a General Liability policy. NOHA liability provides coverage to the sports organization for its vicarious liability arising out of the use of a hired auto, such as a charter bus. 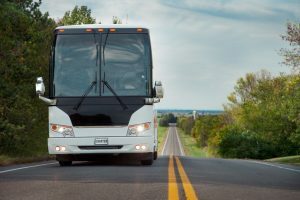 Accident victims often allege that the sports organization was negligent in the hiring of a charter bus company with an inadequate safety record, with no insurance, or that they did not adequately supervise the wearing of safety belts by the minor passengers. Select a charter bus company with a satisfactory safety record. Before signing the contract of hire for the charter bus, request the DOT number. Then perform a Safety and Fitness Electronic Records (SAFER) Systems search to determine the carrier’s safety rating (satisfactory, conditional, or unsatisfactory). This link will also verify the carrier is authorized to transport passengers for hire; if the permissible territory of operation is interstate or intrastate; inspection records of vehicles, drivers, and HAZMAT; the crash record, and the date of the last compliance review. Only carriers with a satisfactory safety rating should be hired. Verify adequate insurance. Use the carrier’s DOT number to perform a Licensing and Insurance Search. Verify the required limit of liability insurance and if the carrier currently carries a limit high enough to meet that requirement. A $5,000,000 limit is required by federal law for charter buses that cross state lines and carry 16 or more passengers. The report will provide a list of policies in force from present to past including effective date, cancellation date, insurance carrier name, policy number, and limit of coverage. Verify a 24-hour emergency dispatch system. 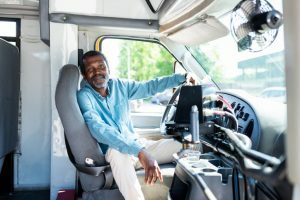 The charter bus company should have a 24-hour emergency dispatch system with live representatives on duty to respond to last minute changes, emergencies, and other unexpected problems that may arise. Wearing of seat belts. Sports organizations traveling with youth participants should always provide adequate supervision to avoid lawsuits for negligent supervision. If the bus has seat belts, staff should make sure that all minor passengers are wearing their seat belts. Since November 2016, all newly-manufactured buses are required to be equipped with lap and shoulder belts for each driver and passenger seat. The sports organization should make its best efforts to select a charter but with seat belts. Adhere to DOT out-of-service regulations as follows: drives a maximum of 10 hours after being off duty for eight consecutive hours and does not drive more than 70 hours in an eight-day time period. Source: Chad Cushman. “Charter Bus Safety: 5 Things You Must Know.” Indian Trails Blog. 29 Mar 2014.